From the early days of psychoanalysis, psychotherapists,with their unique and privileged access to the inner world of their clients were the first to react with astonishment at the stories of trauma and abuse recounted in their consulting rooms. When they and their clients eventually started to publish accounts, they were, and are, frequently met with incredulity, then ridicule, then hostility. There is no better or braver person to speak on this topic than Dr Valerie Sinason, a pioneer in working with patients at the most complex ends of therapeutic work, including those suffering learning disabilities and/or extreme forms of dissociative disorders. Valerie will be asking the question “How can we avoid being non innocent bystanders?” – and inviting her audience to think with her about our responses. This workshop is for trauma survivors and any student or professional working in the field of complex trauma: psychotherapists, counsellors, psychiatrists, social workers, teachers, police and probation officers. Valerie is a poet, writer, child psychotherapist and adult psychoanalyst . She has witnessed her own fearfulness as well as the fearfulness of her profession once a patient with intellectual disability revealed a level of abuse that was not accepted. She was the founder of the Clinic for Dissociative Studies, and the publisher of many papers and books on the subject of extreme trauma. In 1994, her work on “Treating Survivors of Satanist Abuse” was one of the first books published in the UK that documented some of the stories of abuse, and the ensuing difficulties for professionals – social workers, therapists, the medical profession, the police, the court of finding a place in their minds for these stories. In 2010, she published “Mental Handicap and the Human Condition: An Analytic Approach to Intellectual Disability”. This landmark book was one of the first to provide verbatim accounts of therapy sessions. 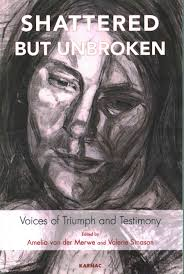 In 2016, she published “Shattered but Unbroken”, jointly with Amelia van der Merwe – an edited volume focusing on Dissociative Identity Disorder (DID), which combines the narratives of survivors of ritual abuse with academic contributions on the causes, correlates and interventions applicable to DID. On Nov 21st 2018 at the Freud Museum, a booked edited by the late Alan Corbett, “Intellectual Disability and Psychotherapy: The Theories, Practice and Influence of Valerie Sinason” was launched.